This week the Augsburg College Muslim Student Association is holding a series of events to generate awareness of Muslim culture and the Islamic faith. These events are co-sponsored by the Religion Department, Student Government, ASAC, AASA, Residence Life, Campus Ministry, WomenÂ¹s Studies. 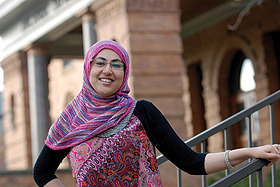 Below two students share their thoughts on being Muslim at Augsburg. During the 14-hour-long flight that brought me from Dubai to New York for the first time three years ago, I questioned and regretted every decision I had made. It had been a bad decision to apply to study in the States. A worse decision to go and live there alone, without family or friends, on an American school campus, where drugs and rock ‘n’ roll would dominate and make my life completely miserable. The biggest reason for my doubts and regrets for coming to study at Augsburg was the fact that I am a Pakistani Muslim woman who proudly chooses to don the hijab (and look quite good in it, if I do say so myself!). Really proud, mind you. But upset, hesitant, nervous that my two most important identities would become the basis of discrimination and hate in America. However, the first person I met at Augsburg made me hopeful. Jim Trelstad-Porter, the director of international student advising, was the first (and only) man who knew that he wasn’t to shake a Muslim girl’s hand if she doesn’t feel comfortable doing it. So he didn’t, and I liked him immensely that very instant. Over the course of these three years, I have realized I could never have made a better decision in my life. True, Augsburg isn’t the gigantic university with huge tidy lawns and rolling hills that I used to imagine as an American school back home, but it is much more than that. Augsburg truly made me feel welcome. As a Muslim, as a Pakistani, as an international student, I have never felt people have been disrespectful, racist, discriminatory, or even amused at my expense. Everyone here makes an intentional effort to be inclusive and open-minded. The best thing I love about Augsburg is that people are willing to ask questions. I always say that asking questions is the first step towards a healthy community where people are at harmony with the wealth of different religions, races, cultures, and people that exist within it. I would much rather have somebody come up to me and ask me why I am wearing a curtain wrapped around my head than give me weird looks or talk behind my back. People here are willing to learn. I have learned that I love to teach. My religion is the most important thing in my life and I am deeply hurt by all the misconceptions and stereotypes that exist in the world about it today. Islam is a religion of peace, beauty, humanity, and love. How can I be so sure? Next time when you see me running around campus, stop me and ask me why. I love answering questions. More importantly, come find me at one (and all) the events that the Muslim Students Association is hosting starting Monday as part of the Islam Awareness Week. I was a bit pessimistic when I decided on choosing Augsburg College. It seemed as though I wouldn’t be accepted as a Muslim there, and that I would have to defend my faith in every single class and discussion that I went into. I felt as though I made a mistake, that I couldn’t take back. Coming straight out of high school and messing up on one of the biggest decisions of life made me feel like a complete idiot. What was I getting myself into? Little did I know that I didn’t have to put on my battle gear outfit; not only was I accepted with welcoming arms, but the opinions that I put into the discussions about religion was greatly useful to some. I always used the motto “Don’t judge a book by its cover,” but I actually didn’t follow upon it till I entered the halls of Augsburg. Augsburg gave me the tools to be myself, to readily participate in whatever I felt like. It has given me the lending hand in which I can accept and be accepted as a whole. As a Muslim American student I’m glad to say that I go to Augsburg College. Banquet: Break your fast with usand share fasting experiences. Get a free headscarf and wear it for a day. Feel what it’s like to be a Muslim woman. There also will be free henna. We know the V-word is special to you as an Auggie! Come learn about what vocation means in Islam. Visit a local mosque to observe evening prayer, tour the building, and talk to the imam (religious leader). Transportation and food provided. Wear green or white to show your support to the struggle for democracy and people’s power. Watch Muslims pray their Friday prayer.